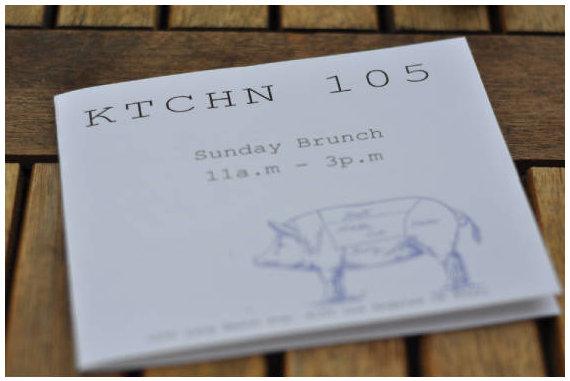 located on a decidedly industrial stretch of long beach avenue in downtown los angeles, ktchn 105 is only open for brunch on saturdays and sundays and reservations are a must. my partner and i decided to ride our bikes over on sunday to meet up with another couple for a bite to eat. 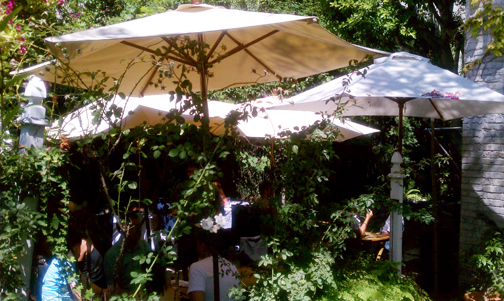 right away i was taken by the open loft space turned restaurant and the beautiful garden-side outdoor dining which in tree challenged dtla, is definitely a perk! found out pretty quickly that you had to jump early on those seats but i wasn’t upset with the indoor seating either. 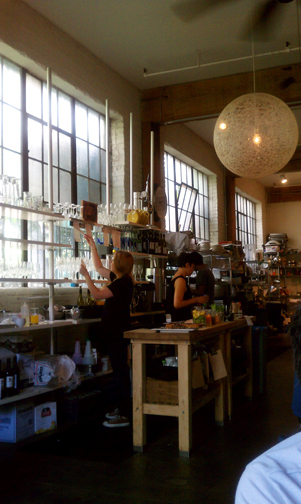 truly live-work, the space also has a dedicated schedule of cooking courses, knife skills workshops and other handy kitchen prep classes for the culinary challenged. fun as that may sound, i was strictly there for the eats! mimosa in hand whilst others took part of the bloody mary/maria offerings, i was all set to enjoy whatever was at hand and from the looks of the weekly changing menu, it was all good. 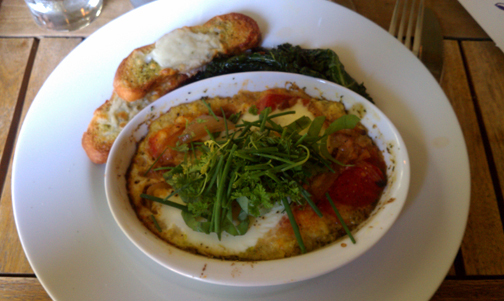 i enjoyed a shirred egg mounted in (their words, not mine) basil butter over polenta with sundried tomatoes, fresh garden herbs and a side of kale. just the right amount of food without the heavy feeling. don’t worry, i fixed that with a piece of their freshly made pecan tart! not the kind of crust i’m used to but still tasty nonetheless. reasonably priced with the most expensive entree at $11 that day, mimosas clocking in at $5, it wasn’t a budget buster unless like me, you like to drink! i enjoyed the extra charm of soft nutty, chocolate chip cookies accompanying the check and i’m looking forward to my next visit, hopefully with garden seating next time!